700 Watts of blending power. Power6 Turbo-Edge blade design to crush ice, puree and mix with maximum efficiency. Pre-programmed Smoothie & Ice Crush functions. Die-cast metal housing with backlit functions. 56-oz. glass easy-pour blender jar. 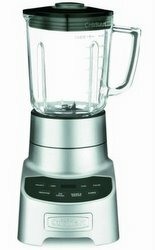 Price $150 Based on the manufacturer's suggested retail price (MSRP), this blender is MORE EXPENSIVE THAN AVERAGE and is priced in the TOP 25% of all blenders. Stars Based on actual user experience and reviews, this blender is RATED ABOUT AVERAGE by 18 USERS when compared to all other blenders. 64% of users rate this blender favorably. The new Cuisinart has surpassed all of my expectations. I love the glass jar and all the options. It works wonderfully. I use it almost every single day ofthe week with great results. I make protein shakes where I put a lot of ice in it so it is kind of like a milk shake. It works flawlessly. We have two friends who gought $600 and $450 700 watt "smoothie makers". I read reviews and paid far less for this and it has been outstanding. While the blender worked it was awesome. Problem is, it only worked 31 days. Estetically, the CBT-700 is hands down the best looking blender we have tried. Taking all things into consideration I feel that the CBT-700 deserves a 5 star rating. We have owned this blender for 4 months.